When will my child start losing teeth? Baby teeth are usually (but not always) lost in order. The first incisors (the front lower middle teeth) generally become loose around 6 years old. The upper front teeth usually fall out next—hence the Jack O’Lantern smiles in many kindergarten and first-grade classrooms. Next come the canines, then the first and second molars. Your child’s back molars may not become loose until age 10 or 12, hence the familiar term “12-year molars.” But keep in mind that these are approximate ages. Some children will lose their first teeth at 5 years old, while others may begin losing teeth at age 7. 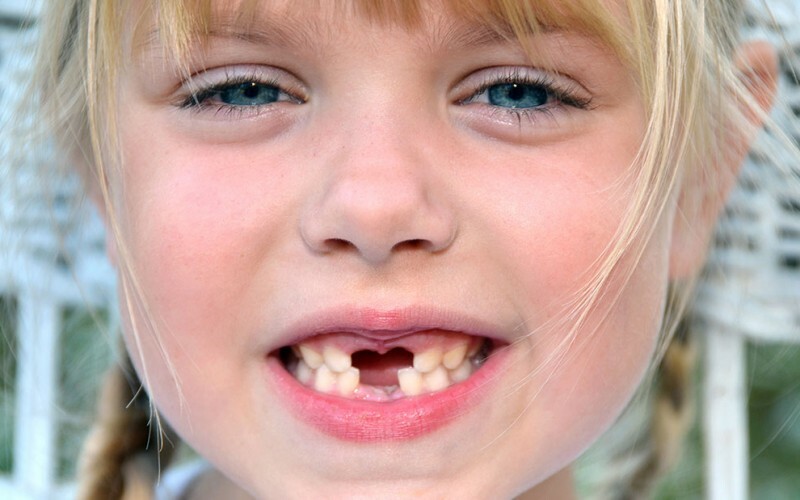 Girls will usually lose their baby teeth a little younger than boys do. If a tooth is very close to coming out and is annoying your child, you can use clean gauze to help your child pull it out gently. Swishing the area after the tooth loss with warm water or saltwater can be helpful to remove the unpleasant taste of blood. If your child is frightened instead of excited by the thought of losing a tooth, reassure them that losing baby teeth is normal. You might even schedule a visit to the dentist to coincide with the first tooth loss for extra reassurance from your child’s dental team. After a baby tooth erupts, you should begin cleaning your child’s teeth with clean gauze and eventually with special pediatric toothpaste and a toothbrush. Kids up to 10 years old may need supervision when brushing and flossing. Older children should wear mouth guards for sports to ensure that they don’t lose teeth prematurely due to an accident. Premature tooth loss can result in teeth shifting out of place as they come in and may require the need for orthodontics later. If your child loses a permanent tooth, place the tooth in a container of milk and go to the dentist as quickly as possible—teeth can sometimes be reimplanted if you take action fast enough. Most importantly, keeping a positive and upbeat attitude about dental care and teeth will help alleviate your child’s fears and lead to a lifetime of positive dental habits. Teeth usually start to fall out around 6 years old, but continue gradually over time, even through pre-teen years. Teeth generally fall out in order, with the lower front incisors usually falling out first. If a tooth becomes loose, help your child pull it out gently with warm water and guaze. If an older child plays sports, be sure they use a mouth guard. American Academy of Pediatrics. When children begin to lose baby teeth,. American Academy of Pediatric Dentistry. Guideline on management of acute dental trauma. Yes, it is firstly the lower incisors followed by upper incisors, canines and molars are lost in a child in order. Tooth falling time may also vary child to child (sometimes, not matching regular time periods of tooth loss). Well information, especially the tips given on children and healthy teeth, so far!